1. Drain and pat fillets dry and cut into 2 serving pieces. 2. Combine oil and lemon juice in a baking dish. Add fish and turn to coat both sides. Sprinkle with basil, pepper, and salt. 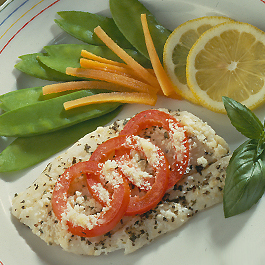 Overlap tomatoes in an even layer on fish and sprinkle with Parmesan cheese. Cover with foil and bake at 400° F about 10-15 min. or until fish flakes easily.